Stung by a disappointing loss to Norfolk Catholic Tuesday, Boone Central/Newman Grove regrouped Thursday to apply a little sting of its own. 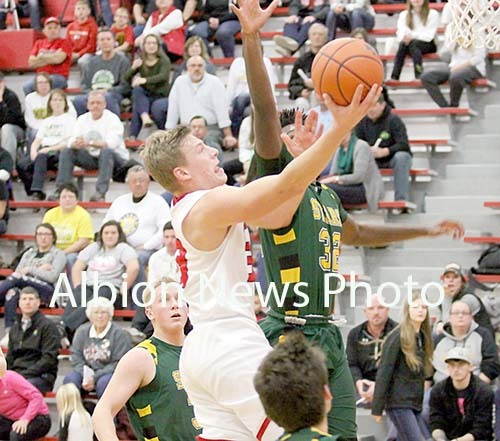 BC/NG hosted Class C1 #10 Kearney Catholic in Albion and made the needed plays down the stretch to defeat the Stars 63-59 in final action prior to the holiday break. It was a steady and, at times, dynamic, performance by Boone Central/Newman Grove. In danger of duplicating Tuesday’s devastating slow start, BC/NG rallied from an early 11-5 deficit to lead 15-13 at the end of the first quarter. The Cards did much of their damage in the painted area, with 6’4 center Jessie Sullivan scoring six straight points at one point. The contest continued as a game of mini-runs by both teams, neither able to pull away. The squads traded blows until BC/NG finished the third quarter with a flourish. A Gentrup 3-pointer tied the score at 40-40, and the Card junior then added a free throw and second 3-pointer for a 44-40 BC/NG lead. Sullivan’s 15-foot jumper at the buzzer lifted the hosts to a 46-41 lead. A key to BC/NG’s 13-5 third period run was a halftime coaching adjustment that switched the Cardinals from zone defense to man-to-man, with Stuhr blanketing Holtmeier and forcing the talented Star senior into six missed shots. There was no quit in Kearney Catholic, however. A 3-pointer by John Husmann gave the Stars a 50-48 lead two minutes into the final stanza. Gentrup and Holtmeier again traded 3-point plays before Sullivan took matters into his hands. The big Card junior scored on an assist from Stuhr to put BC/NG ahead 56-55 with 2:30 to play, then added a baseline drive and a hook shot in the lane for a 60-55 lead. Catholic answered with four straight points before Nelson banked in a short jumper to gibe BC/NG a 62-59 edge. The Cardinals rebounded a Catholic 3-point miss that dipped into the hoop and spun out, sank one free throw, then forced a final turnover after Catholic called a timeout with 11 seconds to play.